The best backpacking tea in your backpack is not only a matter of taste preferences, but several other factors that can add up to health benefits on the trail. Tip: Try each of these teas at home, before you're fully committed to carrying them into the wilds in your backpack. You never know how your system will react to something new, and it's best to be at home if you do experience a strong reaction to a brand new tea. All of the teas I use and recommend are organic, and prepared by companies I trust after using them year in and year out. If you're a new backpacker, please realize that "lightweight and useful" is your new motto. Tea takes up almost no room in your packpack, is virtually weightless, is inexpensive, and can be used to soothe, calm, satisfy and hydrate your body after a long day of hiking. So let's take a close look at this wondrous addition to your backpacking menu! One of the biggest mistakes that I've seen hikers make time and again is to neglect their hydration status. "But I'm not thirsty!" she says. "It's too much work to filter or treat more water after a long day of hiking", he groans. You're probably not one of those hikers, but just in case, use this upcoming link to read up on the importance of paying attention to your hiking hydration. get you ready for tomorrow's trail work. If you've been on even one backpacking trip already, you know how sore and stiff you become after Day One. So many reasons why your body is in a low level state of inflammation! Sipping a cup of tea made with ingredients known to combat inflammation is an excellent strategy to cut down the levels of damaging molecules circulating in your backpacking body. If you're really into turmeric as an anti-inflammatory strategy, you can get a sampler of 3 different Numi turmeric teas. Avoiding monotony in your backpacking menu is a very good thing. Am I the only hiker to experience digestive upset when I'm backpacking? The change in diet, away from the fresh food I eat at home, seems to give me a gut ache if I eat dinner too fast. Ditto when I'm famished and gulp down large portions. Digestive aids are useful in these scenarios. Carry this probiotic powder in handy packets to keep the good guys colonizing your gut. If you're like me, you're probably pretty keyed up with excitement the first night on the trail. This is not a good combination, and might make it difficult to fall asleep quickly. Or to stay in a deep, restful sleep while surrounded by unfamiliar smells, sounds and sensations. I have a bedtime ritual that I use when I backpack, especially when I'm solo. Part of that ritual includes slowly sipping tea I know has ingredients to promote restful sleep. All of us have trouble sleeping at one point or another on a backpacking trip. Sometimes it's sore muscles that won't let you find a comfortable sleep position. Other times it's weird noises outside the tent, or plunging temperatures. Use these tips to get your best sleep on a backpacking trip. Women tend to be cold sleepers in their sleeping bags. And the older I get, the colder I sleep. It doesn't seem to matter how thick my sleeping pad is, what the R-value of my sleeping bag is, or how many pairs of socks I'm wearing when I curl up to sleep. So here's my secret weapon: a metabolism boosting tea I ingest right before I crawl into my tent. It never fails to amaze me how wide the spectrum of favorite backpacking foods is with hikers. What I savor might make you turn up your nose. Use these suggestions to get started on building your own tea list. The only way to know if you like tea is to brew a cup and sip it, right? Drinking warm beverages right before bedtime will probably result in midnight trips to the bushes. Tip: On nights when the rain drops on my tent lull me to sleep, I skip the tea. Who loves giving up the warmth of a sleeping bag during a rain storm? Ever hear of a tent pee bottle? It's a wide mouth plastic bottle, dedicated to receiving urine and clearly marked as such. Female hikers might also need a funnel, or a female urination device (FUD). If you stick with the organic brands I recommend, you can compost the tea bags (string and all) when you get home. The worms in my worm bin seem to love tea leaves! Tip: Have a separate plastic bag to collect these bags. They're lightweight and won't smell bad in your backpack. Another benefit of the best backpacking tea as part of your hiking menu is that it's an inexpensive luxury while delivering the six benefits covered above. You can splurge big time on tea bags, and still have money left for costlier items like protein sources in your backpacking menu. One last tip: If you're prone to constipation while backpacking, related to dehydration and dietary changes, try this Smooth Move tea before bed time. 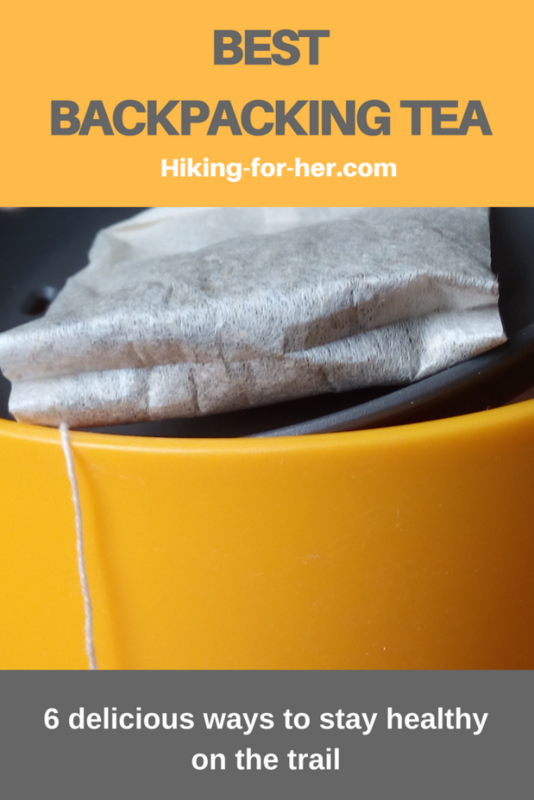 There's no reason in the world to leave loose tea behind when you're backpacking. But I'm a minimalist, meaning that I like to spend the least amount of time possible in the camp kitchen. And I avoid generating smelly, wet food wastes whenever possible. So for me, tea bags are easy to plunk into a hot mug of water and enjoy quickly. Other hikers love a nightly tea ceremony, and swear that a more flavorful mug of tea results when you steep loose tea leaves. Here's the lightweight MSR MugMate tea filter you can use in a mug for your own private tea time. Works great for morning coffee, too! Day hikers can brew a cup of healthy hiking tea after a day on the trail, too. Same 6 healthy principles apply! And for cold weather hiking, why not brew up a batch of tea and carry it in your double walled insulated Hydroflask? I love to try new backpacking teas, so please send your suggestions and I'll share them with everyone in my monthly free newsletter Happy Trails. This bright blue box is your chance! 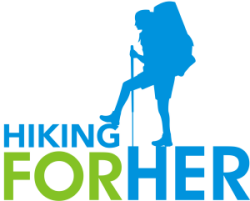 Purchasing hiking essentials through links on this website will not only get you plenty of delicious tea, but will also support Hiking For Her's mission to keep the best hiking tips flowing freely around the globe. And it costs you nothing extra.